If you find yourself having trouble falling asleep or if you wake up in the night and find it difficult to go back to sleep, you need to practice this relaxation exercise. Start with finding a comfortable position in bed, focusing your attention solely on your body and any sensations you feel. 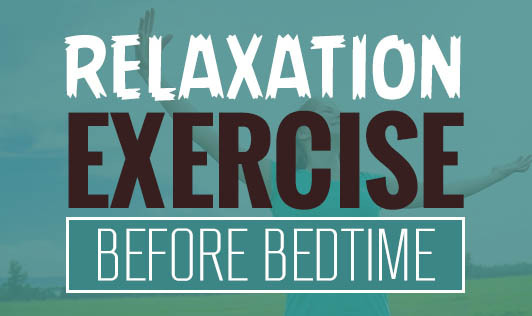 Relax and try to reduce any tension you feel in your muscles. You might occasionally find your mind wandering while trying to do so. The trick is to gently bring back the focus to your body. This requires practice so do not give up. Begin by paying attention to your breath, as it enters your nose, chest, and abdomen. Concentrate while taking deep breaths, from start to finish. If you find yourself distracted by anything else, try and bring the focus back to your breathing. Start to notice your breath and where you feel your breath in your body. You might feel it in your abdomen, your chest, or in your nostrils. Focus your attention on the full breath, from start to finish. If your mind starts drifting, gently try to redirect it back to your breath. Take a deep breath to fill your lower abdomen (not your chest) and feel your tummy expand with air. Hold this for a few seconds and then release. Pay attention to the rise and fall of your stomach, and the air coming in and out a few times. Visualize air filling your abdomen, and subsequently moving out through your airways; again and again. While you are lying down, scan your body, starting from your toes, for any tension that you may be feeling. Release the tension by trying to direct your breath to that part of the body. Then return the focus to breathing. After you have scanned your body, return to a simple breathing pattern, continuing to notice your breath and picturing it flowing in and out of your belly. Practice this on a regular basis and do not be discouraged if it does not work all at once. Persevere and you will succeed.